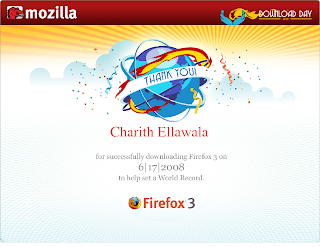 Lucid Electric Dreams: Firefox 3 sets a world record ! The Firefox Download Day was an absolute success with over 8 million unique copies downloaded within the first 24 hours of release. The Guiness book of world records has officially confirmed it today. Don't forget to get your Download Day contributor certificate. :) Mozilla will be mailing you a link to the site to download it.